The time has come for endless amounts of binge watching Christmas movies! I could honestly watch them all year long, but this season is the peak for me. I always seem to have one on in the background. Growing up my mom would buy a new Christmas movie each year so that we could watch it while decorating the tree. It usually ended up with my dad stringing the lights and garland on by himself while my mom, sister, and I watched the movie, only helping to hang ornaments once the movie was practically over. That’s a tradition I happily keep going year after year. With Netflix, I usually don’t have to go and buy a movie (which Chris appreciates). But this year the one movie I really wanted to watch isn’t available on there! So of course, I had to go buy a copy! And because I love Buddy from Elf (who doesn’t really?) I wanted to put my absolute favorite quote from the movie on a canvas. This post contains affiliate links. Please read my disclosure page for more information! Every year I get together with a group of girlfriends for a Pinterest party. It’s always a blast and everyone makes the most wonderful things! This year, instead of having a set project to do, everyone did whatever they wanted. It worked out really well because some people made gifts and others made things for their homes. And everything came out great! I apparently like making things complicated for myself and decided to do a canvas with multiple colors. I’ve never done this before and was pretty nervous, but I decided to try anyway. What’s the worst that could happen? Really I’d just waste some vinyl if it didn’t work out. Luckily I didn’t waste any vinyl and the mulit-colored thing wasn’t too hard to do at all! Here’s how I did it. 1. I cut out all my vinyl before the Pinterest party and brought it with me. To get everything in different colors I would delete the green part of the saying and cut out the red. Then I would backtrack and cut out the green. I kept doing this until the entire design was cut! 2. Paint a light layer of mod podge on your canvas. This helps the vinyl stick (something I didn’t know when I made my Peter Pan art. If I did it would’ve saved me a ton of frustration!). 3. Weed your vinyl while the canvas dries. 4 (a). Cut a piece of transfer paper that’s as big as your canvas. Then place it over top each piece of weeded vinyl until your entire design is on the transfer paper. Once that’s done you can finally put your design on your canvas. 4 (b). Cut three pieces of transfer paper as big as your canvas. Put each color on a different piece of transfer paper and then line it up and place it on your canvas. And now you have a perfectly good reminder that you should sing your favorite Christmas carols loud and proud, no matter how on or off key you are! I know Chris is super excited to have this reminder hanging around….not that I ever need a reminder to sing on a daily basis. I’m sure our neighbors love hearing me spread the Christmas cheer! So tell me, what is your favorite Christmas movie? 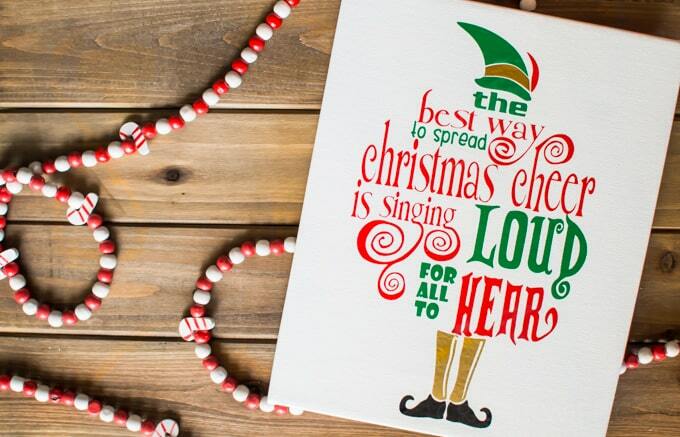 Is Elf a favorite in your household? 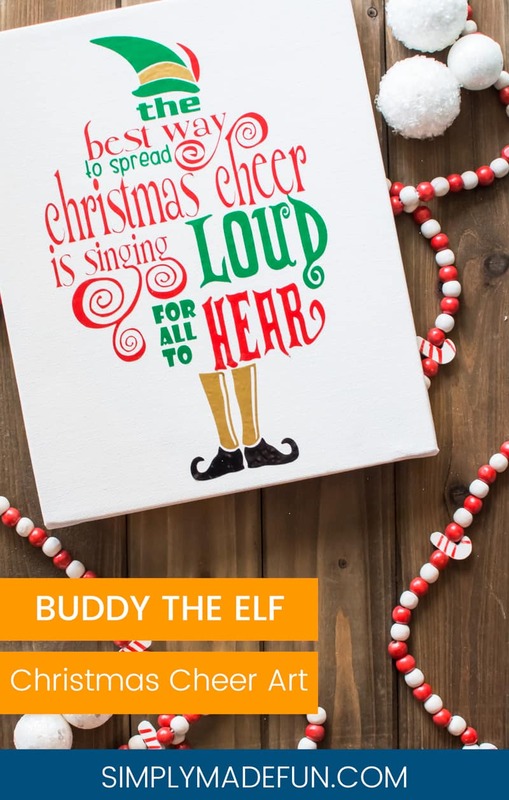 If you want some more holiday goodness, check out these projects below! I love how this turned out! It is so cute! Now to get my canvases to come out this good haha! Thanks, Emily! It’s not perfect but it came out pretty well. I can’t complain. 😉 And seriously, you’ve got this! I know you can do it too, just takes a bit of patience (which I clearly don’t have based on how many other silhouette projects I’ve botched. haha). I love Elf!! This is super cute!! My girls and I have a tradition of watching White Christmas while drinking hot chocolate Thanksgiving day. Love it!! Thank you, Crystal! And what a fun family tradition! Classic Christmas movies + hot chocolate is the most perfect combination.